What's the difference, you ask? Note the word "Automatic" on the dial of the ref. 47050. The ref. 37150 uses a manual-winding caliber 1150, whereas the latter 47050 uses the self-winding caliber 1125, based on the JLC caliber 889. He was also seeking info on the caliber 1150. I consulted multiple references I have at hand, and wasn't able to find any information, making it a rather mysterious reference. Then I recalled a recent post showcasing some Collectionnneurs vintage watches at Vacheron's NY Boutique. The ref. 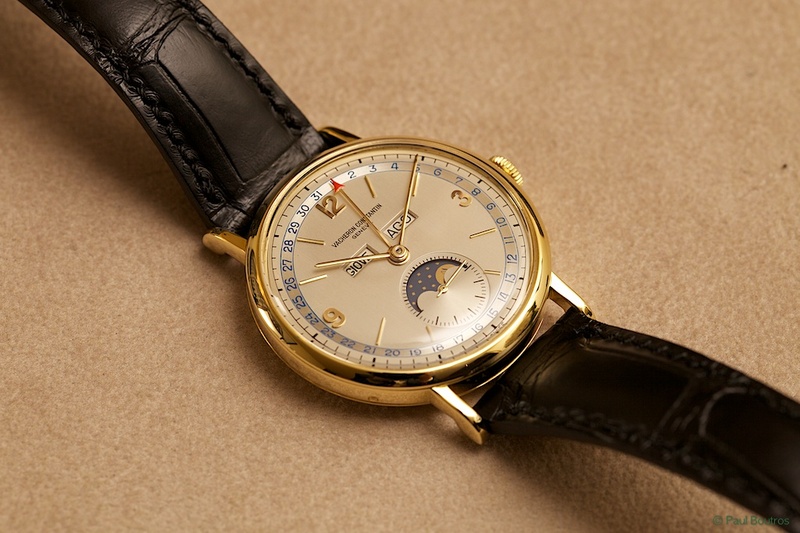 92232 also used a manual winding caliber - Vacheron's legendary caliber 485 - the same movement found in vintage triple date moon phase watches dating as far back as the 1940s. My belief: The ref. 37150 was the successor to the very rare ref. 92232...made in 1984. It was probably produced for just a couple of years at most. Inside this reference is the manual-winding, 17-jewel caliber 485. From what little data I was able to dig up on the caliber 1150...17 jewels, adjusted to 5 positions, manual winding, etc., I'll wager the cal. 1150 is the same as the caliber 485, which also used 17 jewels - perhaps with a minor modification that differentiates it from the cal. 485. It could be the manner in which the calendar is set was changed. I suspect the location of the pushers for the date / moon phase functions are different. So that's my theory. Of course, I'd welcome any additional information on the reference 37150 or the caliber 1150. Previous Topic: For those in the US - Happy Thanksgiving!